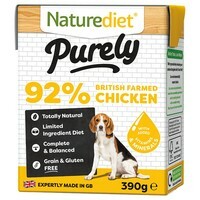 Naturediet Purely Chicken is a nutritionally balanced complete diet that has been specifically formulated for dogs with food intolerances and/or food allergies. Freshly prepared with limited ingredients including a single protein source, this delicious meal contains added vitamins and minerals, and has been gently steam cooked to lock in all of the important nutrients. Naturediet Purely can be fed as a complete meal or with a high-quality mixer.